Few people find a new theory accessible until they first see errors in the old way of thinking. Part I of this book challenges the universally accepted paradigm under which humans' rational reactions to exogenous (external, or externally generated) causes purportedly account for financial market behavior. The current chapter explores whether dramatic news events affect financial markets. In the physical world of mechanics, action is followed by reaction. When a bat strikes a ball, the ball changes course. Most financial analysts, economists, historians, sociologists and futurists believe that society works the same way. They typically say, "Because so-and-so has happened, it will cause such-and-such reaction." This mechanics paradigm is ubiquitous in financial commentary. 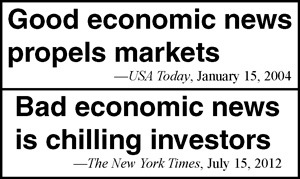 The news headlines in Figure 1 reflect what economists tell reporters: Good economic news makes the stock market go up; bad economic news makes it go down. But is it true? In other words, he accepts the mechanics paradigm of exogenous cause and effect with respect to the stock market but says he cannot predict a major cause part of the equation. The first question is, if one cannot predict causes, then how can one write a book predicting effects? A second question is far more important: Is there any evidence that dramatic news events that make headlines, including terrorist attacks, political events, wars, natural disasters and other crises, are causal to stock market movement? Suppose the devil were to offer you historic news a day in advance, no strings attached. "What's more," he says, "you can hold a position in the stock market for as little as a single trading day after the event or as long as you like." It sounds foolproof, so you accept. His first offer: "The president will be assassinated tomorrow." You can't believe it. You are the only person in the world who knows it's going to happen. This article was syndicated by Elliott Wave International and was originally published under the headline The Myth of Shocks. EWI is the world's largest market forecasting firm. Its staff of full-time analysts led by Chartered Market Technician Robert Prechter provides 24-hour-a-day market analysis to institutional and private investors around the world.